A company’s goals and objectives are the foundation, which measures how much distance it has covered to attain its vision. Goals are defined as the lifelong aims, which an individual or entity endeavor to achieve something. It determines what the company is attempting to accomplish. On the other hand, objectives are the specific milestones which a person plans to achieve in a limited period. These are precise, measurable, time-based, actions that assist in the achievement of goal. Every company sets out is goals and objectives, in order to reach its mission and vision. These are specific outcome which an enterprise aims to accomplish within the particular timeframe, that too with available resources. Take a read of the given article to understand the difference between goals and objectives. Meaning Objectives are the achievements which can be attained only if the attempts are made in a particular direction. A goal is a long term purpose which a person strives to achieve. Goals are defined as the target or purpose that a person imagines or plans to accomplish or to reach or to achieve in future. They are the driving force that directs a person to make efforts to achieve it. In our childhood, we decide, what we want to become in the future and strives to achieve it. The goal is that point which a person envisions himself, after a particular span of time. To achieve these goals, people usually put a timeline, so that they can reach their goal in the desired time. However, they are long term. The aim or target which you want to achieve within a limited period is known as the objective. They are the milestones that help you to reach your goal. That is why they are also termed as subgoals. It is a step to reach a particular point. Suppose I want to score 90% marks in an exam to get admission in a good university. Objectives are easily measured when the target is achieved. For example, A company wants to increase its sales by 50% in the upcoming six months and then when it hits the target it can be measured through the sales figure. The goals are the broad targets, which can be achieved through continuous actions taken in the particular direction. Objectives are the aims that you want to achieve in a short span of time. The goals are the result i.e. a primary outcome, but if we talk about objective, it is a stepping stone for achieving the goal. The goals are based on ideas, whereas objectives are facts based. When it is about the time limit, it is difficult to determine correctly that in how much time it can be achieved, but objectives can be time bound, in essence, they can be attained in a given period. It is hard to measure goals, i.e. how much distance you have covered till now, while chasing your goal and how much is left to be achieved. On the other hand, objectives are easy to measure. The goals are abstract, while objectives are concrete. The goals require general actions to attain it. As opposed to objectives, that needs specific actions. Although there is a difference between goals and objectives, objectives are the steps that you take to achieve your goal. So, it will not be wrong if we say that objectives are a part of the goal. Goals involve lifelong ambition; it defines the destination where you want to see yourself after a particular period. 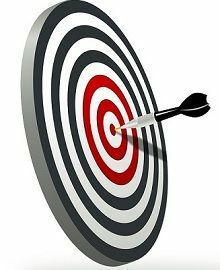 The objectives are short term targets that you set to achieve something, in a fixed period.